We Are Little's are passionate about good quality, great tasting coffee. They are a family owned and run company, that produce an exciting range of Arabica coffees infused with different flavours to create coffee that livens up your cup! Coffee o’clock at The Click Hub has become a much more exciting and tasty affair since working with We Are Little's and our personal favourite flavours include Maple Walnut and Island Coconut. Having stocked their coffees on Amazon for quite some time, they were less than content. 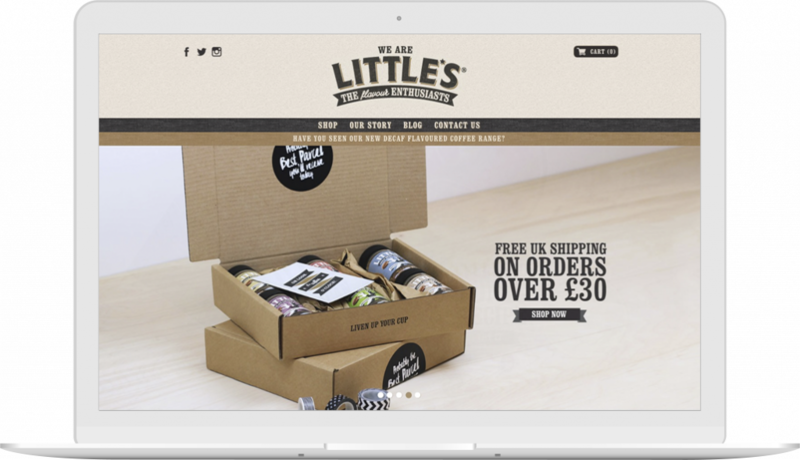 Having stocked their coffees on Amazon for quite some time, We Are Little's were less than content with the listing fees and commission eating into their profits and so decided to get a dedicated website of their own. Our challenge was to get consumers to this new website by ranking organically on Google and compete with big-hitters like Douwe Egberts and Tesco. This had to be achieved in a short time frame to deliver a good ROI for the client. We identified search terms that were highly relevant to We Are Little's’ products. ‘flavoured coffee’ and ‘flavoured instant coffee’ received a substantial amount of monthly searches and so would deliver good quality traffic to the website. Our SEO then consisted of optimising the meta-data and content on specific webpages to increase the website’s relevance to those search terms and running an extensive link-building campaign to increase the new website’s domain authority. In addition, we provided SEO consultancy for their social media strategy and blog writing, as well as managing their Google products so everything tied in together. Within just five months, We Are Little's were ranking on page one of Google for over 12 key search terms that were delivering high-quality traffic. Working in partnership with Illicit Web Design, we also achieved an incredible conversion rate of 7.23%, substantially higher than the industry average. The traffic from Google went up 51% in this time and their revenue increased by over 60%. We are continuing to work on improving their ranking to attain the top positions for key search terms and beat competitors who have held the number one spot for years.